Achieve a smooth, flawless make-up base with the Shiseido Synchro Skin Glow Luminizing Foundation; a lightweight, long-wearing formula that delivers up to eight hour hydration. 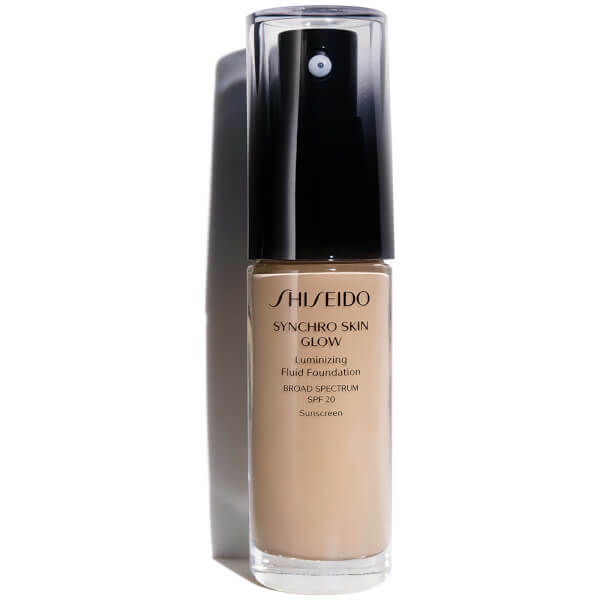 Developed with Advanced Sensing Technology, the liquid foundation works with the skin's tone and moisture levels throughout the day for a photo-ready complexion with a fresh, dewy finish. Infused with a nourishing blend of Argan Oil, Yuzu Seed and antioxidant Wild Thyme Extract, the fluid, serum-like formula blends seamlessly onto skin to deliver buildable coverage with natural-looking, streak-free results. Helps to minimise the appearance of fine lines and enlarged pores, whilst restoring a youthful, luminous glow. Shake well. Apply after skincare, smoothing on evenly from the centre of the face outward. Build your desired coverage level with additional layers. It's my absolutely favourite foundation. Have been looking for something natural looking, not greasy,but moisturizing for quite a while. A friend of mine gave me a sample to try,since then I am not buying anything else. I was struggling to find a foundation that could suit my very dry skin. This is just perfect. It keeps my skin hydrated throughout the day and gives me a nice complexion.